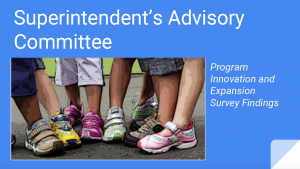 Below is the work of the Superintendent’s Advisory Committee which began in August of 2014. We researched innovative programs and developed a community survey about our current programming and future possibilities. Please take a few moments and review the results. It is my hope that the content might spur conversation and creative options for our students. Click for Program Innovation and Expansion Survey Findings! Click for December 9, 2015 Presentation!